Rather, you must grow in the grace and knowledge of our Lord and Savior Jesus Christ. All glory to him, both now and forever! Amen. Welcome to StoneWater Preschool! Our mission is to partner with parents to provide a faith-filled, safe, exceptionally-loving environment, that equips children to learn, grow, and become all that God created them to be. We opened the doors in August of 2018, and are one year young! We are so thankful for the growth that God has provided and the fruit of the learning that is occurring. Our staff is very dedicated to the calling God has placed on their lives. They truly want the best for your children. 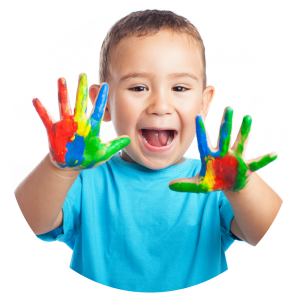 Our promise is to teach your child at age and developmentally appropriate levels in the areas of spiritual, social and emotional well-being. Academics are important to us too! Please know my door is always open for questions and suggestions! Centrally located in the heart of Granbury at the rear of our StoneWater Granbury Campus. Just look for the friendly forest animals on the doors! We take your child’s safety seriously. At StoneWater Preschool, you can be ensured your child will be in a safe, loving environment surrounded by teachers who take the time to invest in your child’s education as well as their well-being. We use a secure software called Procare to check your children in and out each day, and our facility and classrooms are only accessible using a family specific security code. A driver’s license is also required to be on file of anyone authorized to pick up your child from the facility. We believe preschool should be fun! We offer hands-on activities, music, centers, inside and outside play, art and even a visit each week from the loving staff at Gym-Kats as they teach our preschoolers how to tumble!! We know the most important aspect of any school starts with the teacher and administration. They shape your child’s experience and ultimately how their year goes. Because of this we hire only truly gifted teachers with a track record of loving little people well. We accept children from 12 months as of July 2018 (walking independently) to 5 years of age. Each classroom has a specific age appropriate curriculum that focuses on building a solid Christian foundation and an exceptional advantage in literacy and reading. Stonewater Preschool also has the full support of our pastoral and administrative staff as well as access to church resources. StoneWater Preschool opened in August of 2018, and although the preschool is new to Granbury, creating a faith-filled fun environment for children is not. Our staff has years of children’s ministry experience. We desire to go the extra mile to make StoneWater Preschool an exceptional experience for the most precious gifts in your life. From gifted, seasoned teachers to a Christ-Centered curriculum, we have a preschool that you will be excited to send your child to. We have already seen God answering so many of our prayers through our staff, families and children. God is certainly blessing our school!